There are lots of things to love about autumn. Halloween, fireworks, Starbucks Salted Caramel Mocha's (which sound gross but are totally yum by the way). One of the things not so great about this time of year is the dreaded lurgy that seems to travel around the office and infect everyone. I used to be sceptical about herbal remedies until I started taking echinacea, and it is just amazing. I start taking it the minute I start to notice the first signs of a cold. Usually a scratchy sore throat and a runny nose. If I start taking it early enough, I can sometimes avoid a cold completely. If not, I find that echinacea can cut the amount of time I feel ill for. 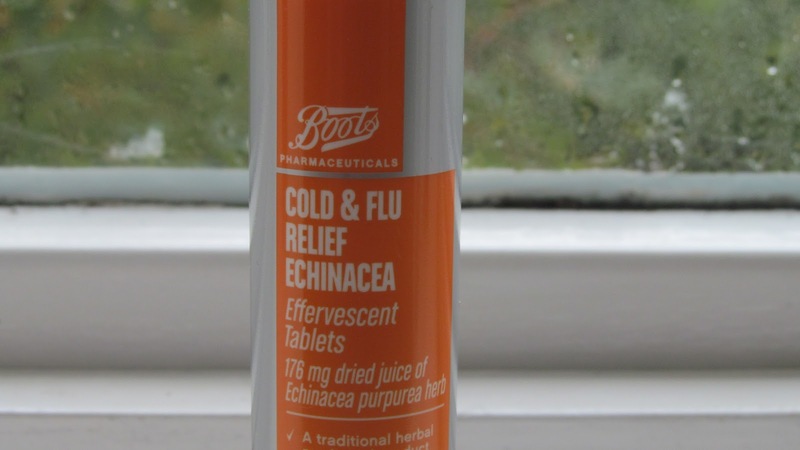 You can get it in tablet form but I prefer this effervescent tablet from Boots. Dropped in a glass of water it looks like prosecco and tastes like elderflower. As with any medication you should always read the label beforehand and check with a pharmacist or your GP. Sheesh, I'm going to have to get me some of this...I already hear my office neighbors starting to sneeze!